Kimber Fiebiger creates bronze sculptures that range from fun and whimsical, to classical and contemporary. 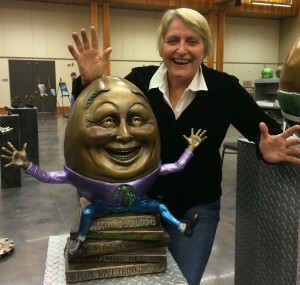 She lives in Minneapolis yet her sculptures have been sold all over the country where she has won numerous awards. Besides being a fabulous sculptor, Kimber has created a home/gallery/studio that will amaze and intrigue you upon viewing. Ask anyone who drives by her Gallery at E Franklin and S 31st Avenues. Her building has been described as having the artful complexity of Spanish designer Antonie Gaudi combined with the surreal nature of Pablo Picasso. Her recent outdoor landscape brings to mind playful images of Dr. Seuss and the imagination of Lewis Carroll.